Sofamania - Armchair with a futuristic yet mid-century modern feel with dark wooden legs. No Arm Chair is available in Black, Orange, and Green and Red. Micro Fiber is the Material. Easy to assemble. Strong Construction.Size: 22 In. (W) x 18 In. (D) x 29 In. (H)Must Be Purchased In Pairs. 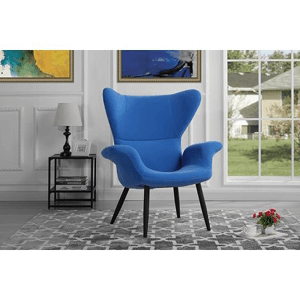 Modern Chair is available in Blue, Yellow, and Red (Shown). Micro Fiber is the Material. Red Or Black PC Cyclone Chair. Beautiful Design. (View Larger Image) Size: 32 In. x 30 In. x 31 In.(H). Side Chair In Tabacco Oak Finish. Chair Features A Leatherette Seat. Made From Solid Wood And Veneer. Strong Construction. Easy To Assemble.Dimensions: 20.5 In. x 25 In. x 39 In. (H)Must Be Purchased In Pairs.For Similar Items See Related Items Below. This Swivel Chair is available in Micro-Fiber Suede and a Bycast Espresso Finish. Chair Size: 27 x 30 x 32 In. (H). Modern Dining Chair With Vinyl Seat And Chrome Legs. Available Colors: Orange, Black, Red And Green. Strong Construction. Easy To Assemble.Dimensions: 28 In. x 19 In. x 31 In. (H)Chairs Must Be Purchased In Pairs. Chair. Available In Color Green And Black. Easy To Assemble. Dimensions: 17W. X 17D. X 33H..
Beautiful Design Chair Perfect For Your Kids. Available In Two Colors: Yellow And Pink. Beautiful Design Chair Shaped Like A Hand. This Chair Is Perfect For Your Kids Room. Chair With Heart Design Back And Padded Seat. Available In Light Pink And Purple Colors. This Chair Is Elegant And Perfect For Your Little GirlÃs Room. Match Chair In Black Or White. High Quality Washable Vinyl Seat And Back With A Solid Steel Chrome Tube Frame. Strong Construction. Easy To Assemble.Size: 25 In. (D) x 29 In. (H)*Minimum Order of 2 Chairs. Saturn Chair. Velour Microfiber Seat With A Chromed Steel Tube Frame. Available In Black, Orange And Sky Blue. Strong Construction.Size: 26 In. (W) x 23 In. (D) x 31 In. (H)*Minimum Order of 2 Chairs.